This naming scheme is quite in depth. The extra information is given to hopefully help you design your network topology. Worlds would be a good choice for things like networks and access points. Asgard World of the Aesir, the warrior gods. The gods built their halls here. Jotunheim World of the Giants. Midgard Middle World, land of men. Muspellheim World of fire, the first world. Nifleim / Hel / Niflhel World of the dead. 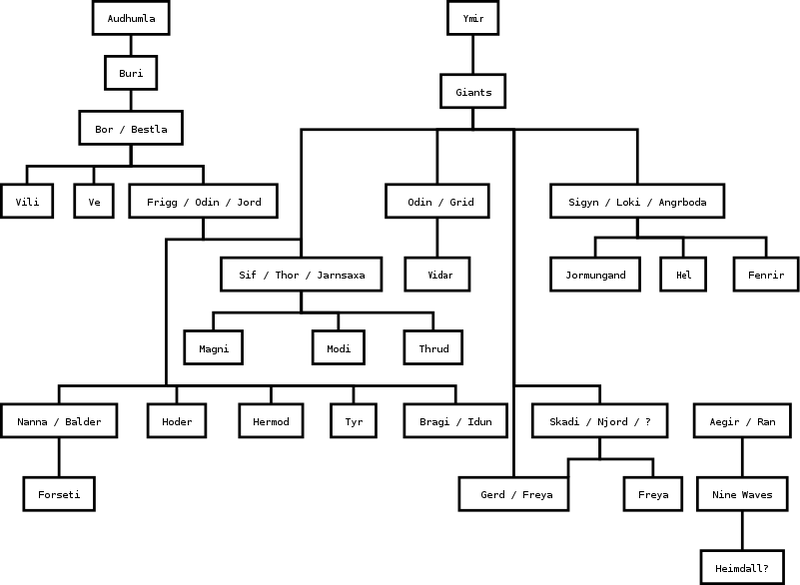 This is the Genealogy of the Main Norse Gods. Created with the windows port of Dia. Aesir - The primary race of the norse gods. They lived in Asgard. Valkyries - Choosers of the Slain, beautiful females upon winged horses. Vanir - A group of gods and goddesses. Guard characters in Norse Myth. Ask and Embla - First man and woman. Created by Odin, Ve and Vili. Lived in Midgard. Mimir - wisest god of the aesir "talking head"
Ragnarok - The final battle, the end. This page was last edited on 21 December 2005, at 04:31.